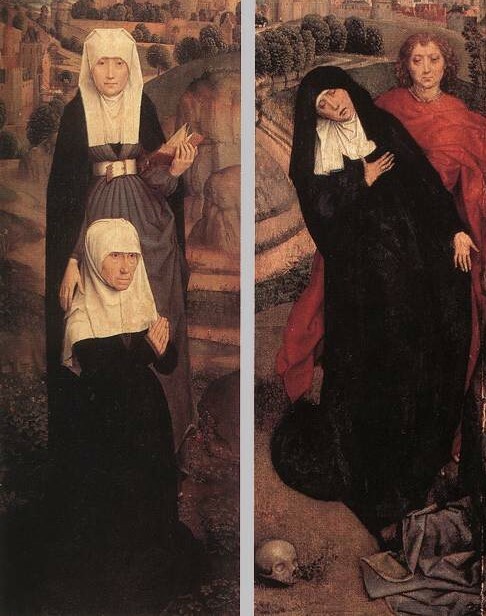 Image: Detail from Hans Memling (1430-1494) triptych of the crucifixion. Note: Devotion taken from last Sunday's sermon on John 19:23-27. Now there stood by the cross of Jesus his mother, and his mother’s sister, Mary the wife of Cleophas, and Mary Magdalene (John 19:25). John describes the women who “stood by the cross of Jesus” (v. 25). This is another reminder that the cross was not off on some isolated hillside but likely on a well-traveled roadway or thoroughfare into the city (cf. v. 20). Christ was not hoisted ten feet into the air but was likely just off the ground, so that his followers could still look into his eyes, speak with him, and witness his sufferings. These women showed a much greater degree of courage, even than most of the twelve (v. 25). Certainly, unlike Peter, they had not denied and disowned their Lord. First among them is the Lord’s mother. From the other Gospels we know that her name was Mary (a form of the Hebrew name Miriam, the sister of Moses). One of the many peculiarities of John’s Gospel is that he never calls Mary by her name in this Gospel. She is instead called, as here, “his mother” (cf. John 2:3, 5). One of the sad things that has happened over the years is that most Protestants avoid saying very much about Mary. Why? Because of so much un-biblical and inappropriate focus upon her, especially among Roman Catholics, where the cult of Mary is pervasive. Some RCs speak of Mary as the co-Redemptrix with Christ. Notice, however, that Mary is not on the cross. She is standing at the foot of the cross. Mary should never be the focus of our worship and devotion. That focus is devoted exclusively to the Lord. The overlooking of Mary is sad, however, because there is much positive that can be said about her. She and the brothers of our Lord, especially James, were among the earliest and most exemplary disciples of Christ. This, in itself, is proof of his divinity. And one sign of Mary’s steadfastness is that she did not desert our Lord in his time of suffering and death. The scene here likely fulfills the prediction made to Mary by the aged Simeon at the dedication of the infant Jesus in the Jerusalem: “Yea, a sword shall pierce through thy soul also” (see Luke 2:34-35). Indeed, how seeing the Lord upon the cross must have felt like a sword through the heart to Mary. We should not worship Mary, but we can admire her. Enlightening and inspirational. Thanks Pastor Jeff. Glad you found this helpful. Thanks for the encouragement.